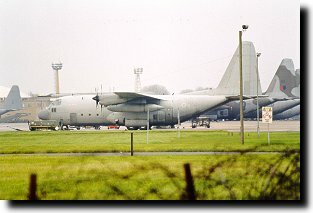 As of July 2011 the airfield has ceased flying operations, with all of the based Hercules fleet having moved to RAF Brize Norton. There appears to be no prospect of any further flying before the station is closed entirely in December 2012 and so this guide no longer serves a purpose. I will leave it up here in its final state for posterity. 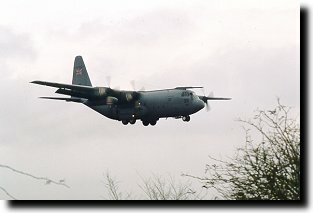 RAF Lyneham is the Home of the Hercules, located on the Western edge of Lyneham village just South of the M4 between junctions 16 and 17, about 11 miles South/South-West of Swindon and 8 miles North-East of Chippenham in Wiltshire. The station is located on the top of a hill and the ground falls away rapidly to the West, with no access roads on that side and lots of trees so viewing opportunities are more limited than at some places but there are still a few spots of interest. Hercules - lots of 'em, from 24, 30, 47, 57(R) (the OCU) and 70 Squadrons. Most are C.3s with a smaller number of C.1s (both based on the C-130K model; C.3s are a stretched variant). 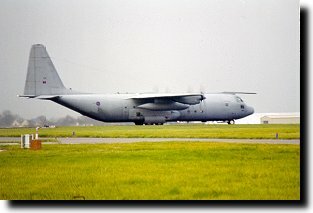 The C.4s and C.5s (aka the new C-130J model, stretched and unstretched flavours) have only just begun to be delivered to the RAF at the time of writing so seeing one of those is a possibility too. Activity is as usual mostly office hours during the week, but it's not too unusual to see a Herc or two exercising at weekends. 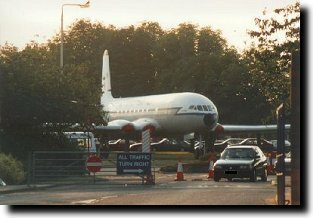 Lyneham is a 24 hour, 365 day a year emergency airfield so is technically always open; in practice though you're not likely to see anything moving in the evenings. Foreign visitors pop in from time to time and are normally limited to transport types; e.g. more Hercs and short/medium haul VIP passenger jets. In the past more aggressive types such as A-10s have popped in too but that's a real rarity. Arriving in Lyneham from the M4, junction 16, A3012 you'll come to a roundabout with a garage on your right. Turn right here and keep on going. You'll pass a garage with lots of cars and vans for sale and may spot the approach lights on high gantries to your left. Just after the road curves left there's a large layby on the left; park here (A). This is Lyneham's unofficial viewing area and offers passable views of the Hercs landing on 25. Unfortunately in deference to the local population's sensitive ears, RAF Lyneham has a number of earth banks surrounding anywhere where sustained engine noise can come from, and this end of the runway is one of those spots. There is a raised bank and some gravel mounds at the edge of the layby to give you a higher viewpoint but you still won't be able to see the runway itself, so anything taxiing out or taking off is invisible. Aircraft on approach to 25 come in fairly low and the vegetation here also complicates matters. You can give yourself a little more time to track an incoming Herc by walking out of the layby, turning right and walking towards the approach light gantries (B) - marvel at the cottage among the approach lights - either a very stubborn resident, or an aircraft nut! You can get head-on approach shots here but the aircraft are higher up than at other airfields so you have less time to get a decent head-on shot. Next spot is a short drive round the corner. Leave the layby, take the first left (signposted for Bradenstoke). You'll see a big silver hangar to your left, with a crash gate entrance. There's nothing visible from here and nowhere to park so keep going past this hangar and the assorted vehicles parked by it. You'll soon see a no-through road on your left; go down this to the end and it terminates at the perimeter fence (C). It isn't a crash gate, and views are very restricted - you might just catch a Herc landing on 25, or taking off, but to be honest it's just not worth the bother. The owner of the house at the end of this lane may get a bit twitchy about people parking here anyway - there's very little room. Abandoning this spot, go back down the lane and turn left. Keep on going for a bit and you'll see another no-through road on the left, this one called Horsefair Lane. Park as quickly as you can as you turn in; it's nice and wide this end but is too narrow to park in further down and the locals apparently have short tempers. Walk down to the end and you're at a crash gate of sorts (D), with the RAF Police dog section training area visible. You have a fairly good sweep across the airfield here, but the geography works against you; to your left trees block your view and the hangars and aprons aren't visible. Still, it should be useful for taking pictures of anything on the runway. Back to the car and turn left out of the lane to continue into Bradenstoke. Keep going straight; ignore the right-hand turn and keep going. The road gets much narrower and you cannot park on it without blocking it. Continue to the end of the lane. There's an area on the left (E) with a gate (normally open); locals appear to use this for parking and going for a walk, so it seems safe enough to do the same. The view from here is pretty poor as you're so far from the runway, but if you continue on foot along the bridleway (the mud track that continues where the road leaves off) you can work your way round to the end of the runway - though it may be easier to just follow the fence as the path/bridleway is not obvious in places. After about 20 minutes you will arrive adjacent to the threshold of runway 07. It is no good here for serials unless an aircraft flies but is superb for photography. A Herc on the piano keys requires a 135 mm lens and on the taxiway just prior to turning onto the runway they can be as close as 50mm depending on where you stand. The perimeter fence is about head high but the ground is uneven in places allowing you to shoot over it at certain spots. The view of the approach is restricted by trees until the aircraft are approximately one mile out so its best to take a radio. You are likely to be visited by the RAF police here because so few spotters bother with this spot. The footpath can be very muddy in the winter and can get a bit overgrown in the summer. The light is behind you at this spot from early morning until around 15:00. If runway 07 is in use it is superb here, if 25 is in use landing Hercs will sometimes roll to the very end of the runway and taxi right past you. Comet gate guard (taken from point G); Nick Challoner If you walk back the way you came there's an entrance to what appears to be a picnic area on your right (F). Poor views no doubt but possibly a pleasant spot for lunch! Okay then, back to the car and drive back to the roundabout we started at. Turn right (if you haven't followed the above and are coming from the A3102, turn left) and you'll soon pass the station entrance (G). There's a Comet gate guard but they can be fussy about people taking photos of it; probably your best bet is to phone the station, ask for the Community Relations Officer and arrange a specific time to go and take pictures. Past the station entrance you get intermittent views of the aprons - unfortunately very few places along this road where you can park. Your best bet may be the fairly large parking area in front of the local video shop, then get out and do some walking (H). Most of the Hercs will be tail-on so it isn't fantastic for serials, and forget photos because of the distance and obstructions. Further along you'll see a bus stop and a road on the right, this road leads into a housing area (I), some of which is occupied by station personnel. As a result, the local police and MoD/RAF Police can get a bit twitchy - many people who've parked here have been stopped and had their car details taken and been asked to move on. From within the housing estate there are a few places you can get distant views of one or two Hercs on the aprons - might be useful for logging serials but no use for photos. Continuing on the main road you'll pass the obligatory RAF station caravan park on your right and will soon see a sign for New Zealand, a small turning to the right. Take this and follow the lane - it's a single track with few places wide enough to squeeze an additional car past, so take it easy. Right to the end and you'll see some houses on the right and space to park to your left - don't park anywhere else, the local residents don't need to be blocked into their driveways. From the parking space (J), you have a good view of the end of runway 36, but sadly it's not used very often at all. However the real point of this spot is not immediately obvious. With the house on your right, parking on your left, look straight ahead and there are trees and bushes, with a track into the bushes. Go in here and over a hump, mind the nettles and you're at the perimeter fence again (which is nice and low), with a clear view of the aprons to your right. Unfortunately the nearest Hercs block those further away but you may still be able to pick out tailcodes if not serials. Pretty useless for photos because of obstructions such as floodlights unfortunately. 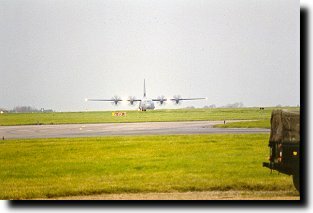 The RAF's first C-130J just turning off runway 18 (taken from point J); author Anything landing on 18/36 is easily viewable but if landing on 18 they often turn off quite far away from you. Anything landing on 07/25 will just be a tailfin, Jaws style, as that runway is the other side of the rise running along the airfield. Leaving this spot, go back down the lane but take the first right (not the driveways, the road - look out for the give way markings). Shortly after you'll see another right turn, take that too. This lane leads around the end of runway 36 and is perfect for approach shots if it is in use; the approach lights are in the adjacent field and there's room to park on the grass verge here (K). With a telescope you might just pick out a Herc on the apron that you couldn't quite see at the previous spot, but you'll be lucky! Now, from the previous spot among the bushes, if you did see a tailfin gliding along the runway, i.e. landing on 25, then you have a brief window of opportunity in which to catch it taxiing at fairly close range (within easy range of a 300mm lens anyway!). However the place to do this from is a little bit sticky... from point K if you continue along the lane (holding onto your lunch as it twists left and right, plunges downward and then rises steeply in various combinations), you'll come round a corner to see some houses. Unfortunately there's a sign saying this is MoD property, and for residents only. However I have been told these properties were sold some time ago and the sign is out of date... who knows? Anyway, if you're going to be quick you can get away with driving up here to the crash gate (L), hopping out of the car and taking a quick picture of any Herc taxiing past. You also have a fairly good view of the aprons, if distant, but the gate is a biggy - a stepladder is a good idea. Anyway, don't hang around. There's nowhere nearby to park without blocking either the crash gate or the residents' houses, so you cannot stay here all day! The nearest place to here where you can get away with parking is in a field entrance which is on your right before you get to these houses (M). The farmer who owns this field doesn't mind people walking around the edge of the field up to the perimeter fence, for a clear view of the apron (almost all serials/tail codes readable but not much use for photos because of the distance). Make sure you keep the farmer happy by keeping to the edge of the field; it will only take a single idiot to walk across his crops and turn him against spotters in common with most of the local residents. You might be able to get away with leaving the car here and walking back to the crash gate, but again it's not a good idea to try and hang around too long. From a map there does appear to be a path or bridleway around the edge of the wood here, from which you might be able to see more of runway 07, but I didn't see any obvious signs of it when I was there and you're probably best off trying this from the other direction - point E - instead. So there you go - Lyneham - you can get by, but a little more work than most airfields! Some local residents can get very twitchy about unfamiliar cars being left parked near their houses, which is very understandable given that one of the roles of Lyneham's Hercs is support of Army operations - so lots of Army personnel in the area means lots of permanently paranoid dudes. It may help if you explain to anybody interested what you're up to, but you may just get asked to move on regardless. The limited parking space at most spots and past actions of inconsiderate spotters means residents have long since lost any patience and are liable to shout first and ask questions later. Petrol, public toilets and various shops available in Lyneham village. Contributors: Dave Newland, Mark Moran, Nick Challoner, Tigger, Phil Smith, Gavin Mills, Neil Chavner, Dave Peel, Gary Watson, Malcolm Court, author.